thoughts. reflections. recipes. photos. from the life of suz. Ever since I was served homemade granola by my friend Rachel during a visit to her place a while back, I've been kind of obsessed with making my own granola. 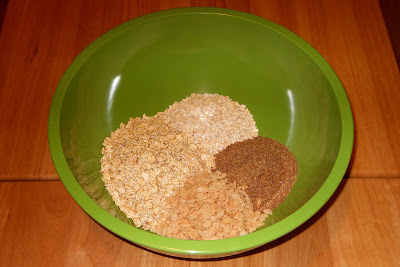 I've poured over granola recipes. I've compared ingredients. I've experimented. I've accidentally allowed a couple batches to get a little too toasty. And I've eaten a lot of granola. First, preheat oven to 250. In a large bowl, measure out 2 1/2 cups rolled oats, 1/2 cup quick oats, 2/3 cup ground flax, and 1/2 cup crisped rice cereal. 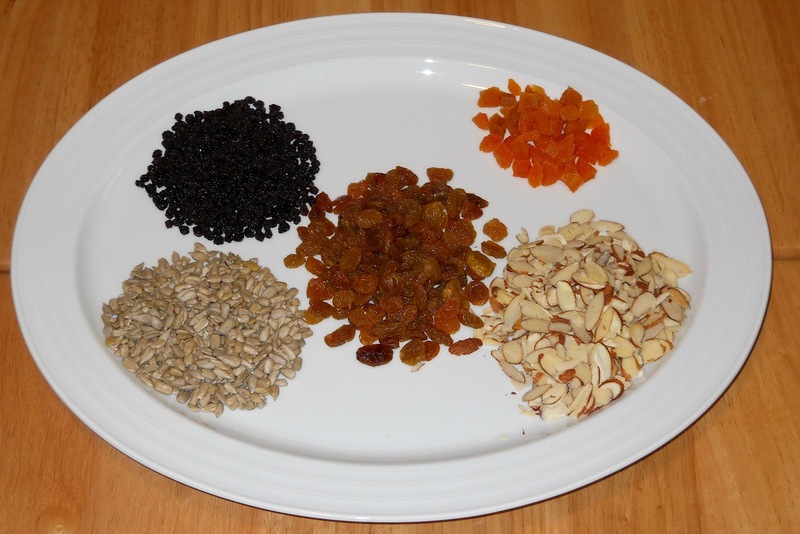 Add to that 1/4 cup raw sunflower meats, 1/2 cup sliced raw almonds, and 1 cup dried fruit (I used currants, golden raisins, and snipped apricots) and mix well. 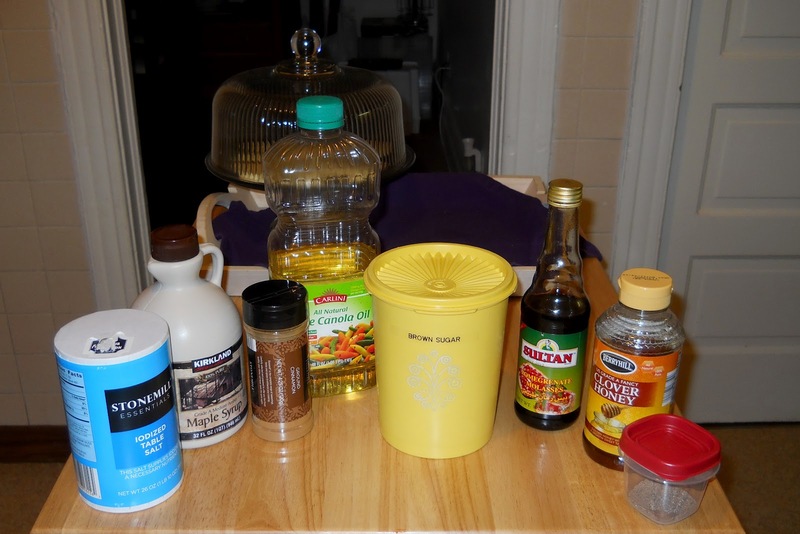 In a 2-cup liquid measuring cup (or small bowl), stir together 2 Tb canola oil, 2 Tb maple syrup, 1/4 cup honey, 1/4 cup pomegranate molasses, 2 tsp salt, 1 tsp cinnamon, 1/4 tsp ground cardamom, and 1/4 cup brown sugar until sugar is dissolved and mixture is well blended. Pour the wet mixture over the dry ingredients in the bowl and stir with a rubber spatula until all of the dry ingredients are moistened. Line a large rimmed baking sheet with parchment paper and spread out the granola mixture into an even layer. 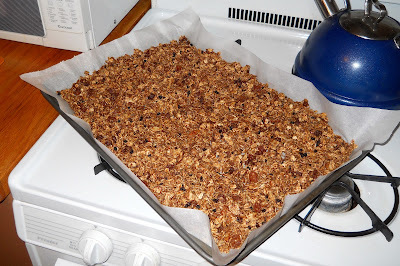 Bake for 30-40 minutes until nicely toasted, stirring the granola and rotating the pan every 10 minutes. When fragrant and toasty brown, remove from oven and allow to cool in pan. When cool, store in an airtight container for up to 1 month. I love this granola with milk as cereal, with fresh fruit and yogurt as a parfait, or just by the handful as a snack. The pomegranate molasses and cardamom set this apart from regular granola by lending a certain fruitiness. If you can't find pomegranate molasses, or don't have cardamom, have fun experimenting with substitutions until you discover your own favorite granola concoction. "Obviously, to be in the fear of the Lord is not to be scared of the Lord, even though the Hebrew word has overtones of respect and awe. 'Fear' in the Bible means to be overwhelmed, to be controlled by something. To fear the Lord is to be overwhelmed with wonder before the greatness of God and his love. It means that, because of his bright holiness and magnificent love, you find him 'fearfully beautiful.' That is why the more we experience God's grace and forgiveness, the more we experience a trembling awe and wonder before the greatness of all that he is and has done for us. Fearing him means bowing before him out of amazement at his glory and beauty." One of the things my sweet Hubs gave me for Christmas was the gift of organization, in the form of a new system for storing my spices. The more I've delved into cooking over the past few years, the more spices I've collected. The collection outgrew my previous system (if you could call half my spices on a stair-step thing in the cupboard and the other half jumbled in a basket in my pantry a "system") and it had gotten to the point that I had a hard time remembering which of the more "exotic" (i.e. rarely used) spices I actually owned vs. had only thought about buying. Which resulted in lots of rummaging, and a few accidental duplicates. I can leave my spices in the bottle they came in. 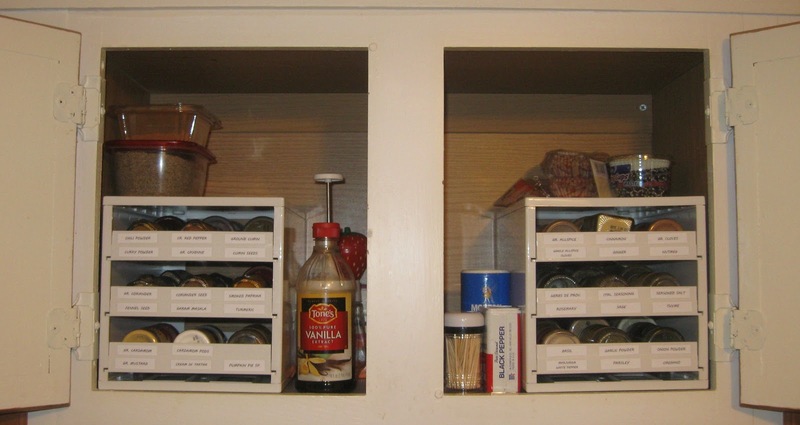 It can accommodate various sizes of spice containers. I can arrange the spices in the order I choose. It fits in a cabinet (and specifically my unconventionally-sized over-the-sink cabinet). 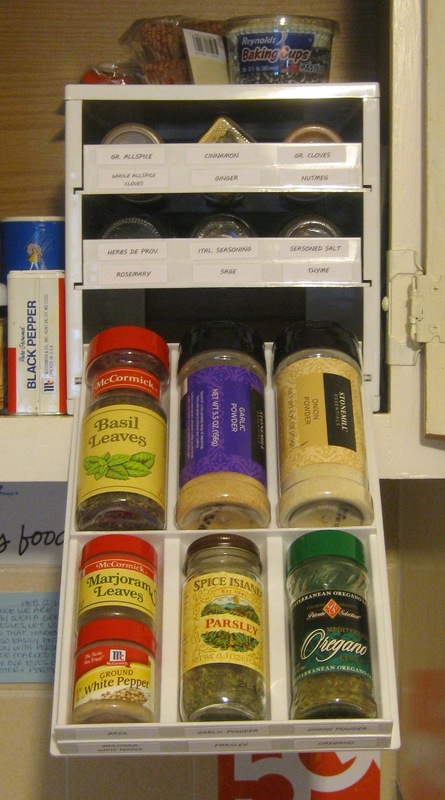 It has space for labels, so that each spice has a designated home. It requires no hardware or installation (since we rent). 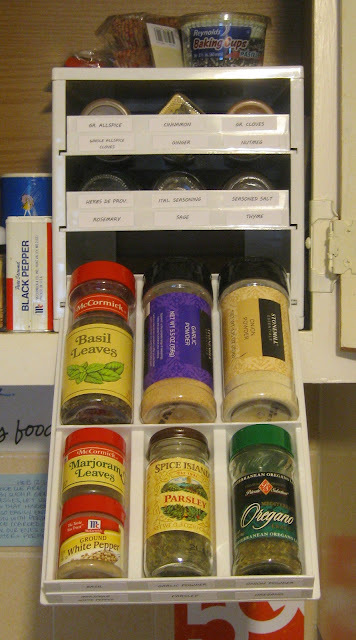 Each drawer of the Spice Stack has six divided slots for spices. 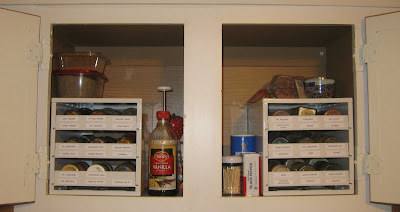 The three slots on the top can accommodate larger spice bottles, while the slots on the bottom can accommodate standard size spice bottles, or two of the little ones (see photo below). Each drawer pulls out and can rest open on its own as you select your spices. There's space on the end of each drawer to affix a label identifying the contents as they lay inside. The start of a new year always seems to get us Americans thinking about reorganizing, decluttering, simplifying, etc. Have you taken on any such projects in this new year? Discovered any helpful products? Have a great tip to share? Leave a comment!